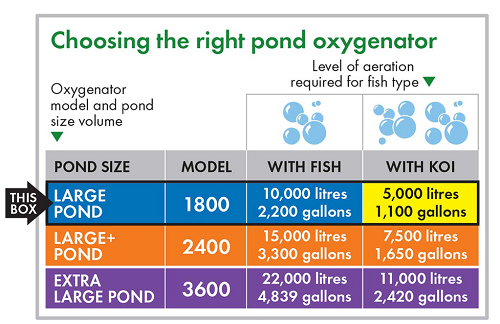 Blagdon's 'Pond Oxygenator' range allows you to run multiple air stones simultaneously, which creates a healthy and oxygen-rich pond that is beneficial for your fish and biological filter media. Pond aeration is essential to a successful pond as fish and other pond life require oxygen rich water in order to remain healthy. Filter bacteria (essential to the breakdown of highly toxic ammonia and nitrate) also require oxygen to flourish, and keep the pond free from the build up of toxic waste. By placing air stones directly into the filter chambers, beneficial bacteria, essential to the well being of a pond, will be encouraged to grow, which in turn will greatly improve filter efficiency and fish health.